BOSTON – Friday, June 16, 2017 – Mayor Martin J. Walsh today announced applications for the 2017-2018 SPARK Boston Council are now available. The SPARK Boston Council is a group of volunteers charged with leading the City’s efforts to engage Boston’s young adult population. Under the direction of the SPARK Boston Director, the 2017-2018 Council will spend the year using its talent and innovation to identify ways in which Boston can grow as an inviting, connected, culturally rich and sustainable place for young adults. Projects may include programming and projects on housing policy, economic development, equal pay, public art and neighborhood engagement. Throughout the SPARK Boston Council Term, members also hear from key members of the Mayor’s staff as well as leaders within City Hall. The 2016-2017 Council featured social workers, small business owners, undergraduate students, union organizers, aspiring faith leaders and more. Approximately half of the group are native Bostonians, while others grew up as far outside of Boston as Georgia, Texas and Jamaica. They currently live in 19 different neighborhoods across Boston. Last year, the SPARK Boston program received more than 300 applications for the Council, showing a robust interest for involvement and engagement. Projects for this Council cohort have included pop-up polling locations to promote the first early voting period in Massachusetts history, the launch of the Chief Chat policy talk series, and the Millennial Homeownership & Networking Social, a collaboration with the Boston Home Center to bring educational materials, lenders, and realtors to millennials. 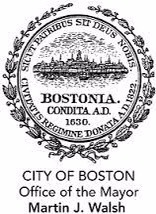 Applicants must be Boston residents, are between the ages of 20 to 34 to apply for the Council. Applications for the Council can be found here and submission deadline is July 16th, 2017. For more information on the SPARK Boston Program, please visit http://www.sparkbos.com/. Boston is home to a large and diverse millennial population. SPARK Boston (formerly ONEin3) is a City of Boston initiative that aims to empower the millennial generation to play a greater role in planning for the future of our city. Learn more at http://www.sparkbos.com.